Posted November 6, 2017 by The Rapid & filed under News. 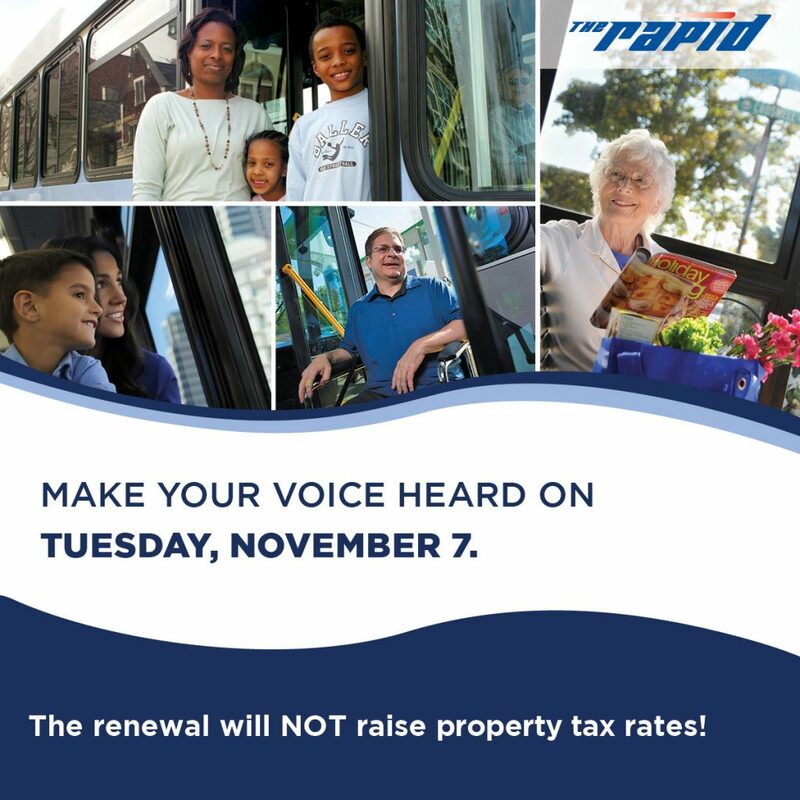 On Tuesday, November 7, a renewal of The Rapid’s operating millage will be on the ballot. We have been operating public transportation service for seven years under the current mill rate of 1.47. We are asking the public to renew the rate for an additional 12 years. A renewal of this millage ensures the continuation of the strong public transportation system that serves the Greater Grand Rapids area. Without millage approval, the majority of public transit service The Rapid provides would cease in the six-city region. At The Rapid, our mission is to create, offer and continuously improve a flexible network of regional public transportation options and mobility solutions. The renewal of this millage directly impacts our funding structure and our mission to provide convenient, affordable and sustainable transportation to the community. Along with passenger fares and state operating assistance, the property tax helps fund The Rapid’s operations budget. The Rapid is a public transit organization funded under Public Act 196 of 1986. This is the method provided by the State of Michigan for local transit operators to provide the necessary local funds for public transit. These local millage funds will provide approximately 35.5% of our operating budget. The remainder is made of fares paid by passengers 16.1% and contract revenues for service14.5% and local bus operating assistance (LBOA) at 32.7% from the Michigan Department of Transportation with other revenue sources making up the balance of 1.2%. Millage funds are used strictly for expenses directly related to operating service. A millage renewal helps everyone, whether you ride the bus or not. The Rapid provides an average of one million rides per month, and these are people who are going to doctor’s appointments, to school, to work, to go shopping, or attending community events. A millage renewal ensures that everyone in our region has access to all of these things. Minimum- and low-wage earners, persons with disabilities and senior citizens also rely on The Rapid to go about their daily lives. Some people need public transportation to get to their jobs, with more than 80 percent of rides being taken to and from employment. Many passengers use The Rapid to receive dialysis, chemotherapy and other medical treatments. Others are unable to drive or can’t afford to own a car and pay for auto insurance. Special-need students depend on the bus to get to school. The millage renewal is essential to The Rapid’s efforts to ensure our community’s most vulnerable citizens can maintain their independence and help low-income workers have access to affordable transportation options. Registered voters who live within the boundaries of the communities identified above in Grand Rapids, East Grand Rapids, Kentwood, Grandville, Wyoming and Walker can vote on The Rapid millage renewal at their precinct on Election Day Tuesday, Nov. 7, 2017.